She inaugurated a host of development works totalling Rs 766 crore, which include a dedicated stadium for indoor sports, two over-bridges and 45 anganwadis--all located in the city, besides launching other development works. "The task of providing these amenities can be achieved across the State if a citizen or a non-government organisation donates a sum of Rs 5.50 lakh for those anganwadis that lack such amenities," she said, adding that the state government has considerably hiked the honorarium being paid to anganwadi workers. The Chief Minister made a strong pitch for launching of the "total sanitation campaign programme' which envisages construction of a toilet in each and every household in villages, towns and slum areas. "It is shameful that women have to wait till night to relieve themselves in open. Shouldn't this warrant the concern of any individual who truly cares for Gujarat and its citizens?... What does it say for us of a society; if we hold a mirror it shows us the ugly truth. "And as it is in all cases, the record of Gujarat and the then Chief Minister and current Prime Minister Narendra Modi is stellar in the field of sanitation," Patel said. 23.1 per cent in Bihar and 22 per cent in Odisha whereas the national average stood at 46.9 per cent." Patel said that the state government has significantly raised the incentive for construction of toilets to Rs 4500 from Rs 600 which is currently provided to per BPL family. "The state government provides Rs 2000 for this purpose to per Above Poverty Line (APL) family," she added. "All these initiatives have led to a massive improvement in the sanitation infrastructure in State. In the last decade, 45.32 lakh toilets had been constructed. Of these 20.05 lakh are BPL household toilets and 25.27 lakh are APL household toilets. In addition, 25307 Anganwadi sanitation units and 1773 community toilets have also been built," the Chief Minister said. 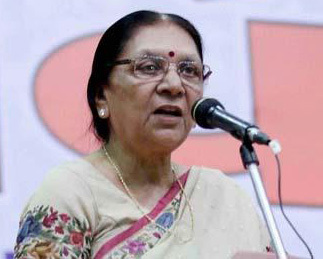 Patel said that the state government has taken a number of initiatives towards welfare and empowerment of women. "(Currently) about 17 lakh women have property documents in their name after the government exempted property owned by women from paying any registration fee and stamp charges," she added. Patel also spoke about providing free medical treatment to BPL families and extension of this facility to APL families having an annual income of Rs 1.20 lakh.